"Which is the more effective way to save Taxes-ELSS or PPF?" Gauri Taresh. " How can I complete me need to plan my tax saving options, with good savings, in the best tax deductions investment options" asked Gauri to Taresh when she met Taresh in his office as part of her financial planning review in February 2016. Taresh informed Gauri -"Gauri, in our last meeting, I had explained to you about the detailed tax saving options (Read more...) about the best income tax saving options, which not only save tax, but could fulfill your goals like your children's education, retirement and wealth creation." Now Gauri informed Taresh: " Since I am in a hurry to submit to my company all the investments done by me for the financial year 2015-16." However, being her financial planner, Taresh suggested to Gauri- "Gauri, you should invest in an opportunity which not only saves taxes for you this financial year but should be inked to your goals and also match your risk profile." Now Gauri was listening and wanted to know more about all the options. Her company admin had told her briefly about the deductions under Income Tax Act Section 80C, 80D etc. Being a financial planner, Taresh explained to Gauri " One of the best avenues is ELSS- Equity Linked Savings Scheme, a high risk mutual fund equity scheme which allows you save up to Rs. 46,350* in taxes under Section 80C, with a maximum tax saving possible up to Rs. 1,50,000/- in one financial year." "Gauri let me also tell you that there is no liability or responsibility for any loss or shortfall resulting from the operation of the scheme. Mutual Fund Investments are subject to market risks, read all scheme related documents carefully." Said Taresh as part of the disclaimer. An ELSS (Equity Linked Savings Scheme) is a mutual fund scheme that invests in equity & equity-related securities. Long term capital growth: An Equity Linked Savings Scheme (ELSS) investing in equity and equity related instruments with the objective to provide investors with opportunities for capital appreciation and income along with the benefit of income-tax deduction (under section SOC of the Income-tax Act, 1961) on their investments, subject to a statutory lock-in of three years. The Income Tax benefit is calculated on the basis of marginal tax rate of 30.9°/o applicable for highest tax bracket).Long Term Capital Gains and dividends distributed are tax-free. Option to invest by way of Lump sum or through Systematic Investment Plan (SIP) or Systematic Transfer Plan (STP). This product is suitable for investors who are seeking Long term capital growth and Income Tax Exemption. Capital Gains TaxLong Term Capital Gains are tax exempt. That means above 1 year, entire gains are tax-free in Equity investments. Income tax benefit under 80 C: Individuals are allowed to invest upto Rs. 1,50,000/- per financial year thus availing rebate deductible from their gross taxable income. On the other hand, there is no ceiling on how much you wish to invest but tax rebate would be limited only to Rs.1,50,000/- in a single financial year while any other mutual fund investments do not qualify for tax rebates. Least investment time horizon: with minimum 3 years lock in. With most of the other tax saving instruments like PPF, NSC and FD being debt instrument category, ELSS is investing 80-100 % in shares, thus bringing high risk high return in minimum possible time horizon, thus making it the shortest lock in instrument in its tax saving category, but remember if in SIP mode, each amount invested every time get locked in for respective 3 years period. Easy liquidity: after the 3 years lock in, you can redeem your equity funds or you can also stay invested till you want to, rather do not have to close necessarily after 3 years thus giving you continued tax-free returns on your investments done earlier. Least investment amounts compared to ULIP or pension plans with minimum of Rs. 500/- per month while most of the mutual fund require a minimum of Rs. 5000/- minimum investment. Tax free maturity: both dividends and growth are tax-free at maturity. Future returns are hence totally tax-free in your hands. Even (proposed) DTC provided tax exemption from long-term capital gains. Great opportunity to get flavors of Indian Equity market, especially for young or early investors who should taste equity when their long-term goals are not within 3 years. 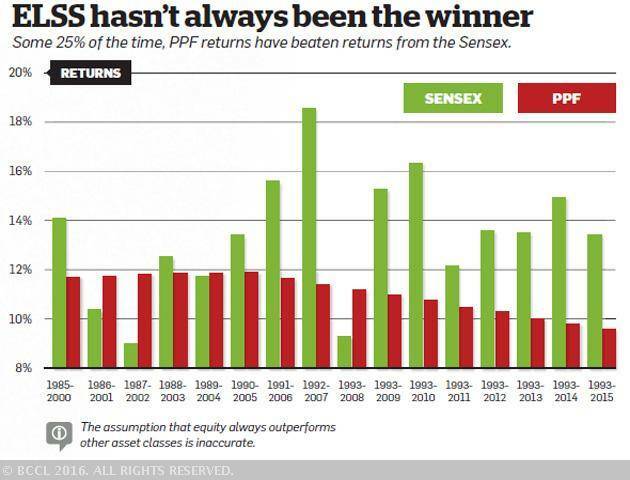 Past 5 years past performance having given 16-19 % kind of returns. Good idea to start saving habit- start the habit with investing on a regular basis. For those looking at creating wealth creation over medium to long-term, ELSS is perhaps the only tax saving instrument which also is an inflation beating capacity. Open ended funds: ELSS are open-ended mutual funds which gives you the option to buy anytime. Illustration of Tax exemption for an individual less than 60 years in receipt of salary income for the assessment year 2015-16. ELSS is a good option for investors who understand the equity market and can withstand its volatility. PPF is a good option for those who don't want to take the risk even in the long-term. Equity-Debt Allocation: No financial planner will advise you to put your entire corpus into equities, just because the holding period is long. Similarly, you should also not avoid equities and go entirely into debt. It is essential to know that as an employee provident fund (EPF), is available to all salaried employees, when calculating one's asset allocation. Understand that EPF becomes your "debt" asset as part of Equity Allocation and a salaried employee, a good part of the debt get already covered by the EPF; hence, if you are investing in an equity (ELSS), your link between debt and equity market should create a balanced portfolio, thus reducing your risk significantly. Your Risk profile indicates your asset allocation but keep in mind also your age as your risk-taking ability. Out of the Rs 1.5 lakh available under Sec 80C, youngsters should invest less than Rs 10,000 -50,000/- in EPF or PPF and the balance should be put into ELSS. For investors close to 50-60, it should become the other way around. Not for risk averse: avoid ELSS if you are not having appetite for risk and also if you are trying to invest for short-term goals. ELSS is for those who understand market linked risk and are ready undertake the journey of high risk with high return concept. Not a great option if you are thinking to link some specific future financial goals with ELSS maturity. Even though the lock in period for ELSS is 3 years, you have to be prepared for a 7-10 years to get the right flavor for equity market. Equity return are highly volatile and therefore may give even erode the basic capital (capital loss) in the short-term. Premature withdrawal is not allowed before 3 years while other likewise tax saving instruments like PPF, NSC with some penalties, withdrawal is possible. This lock in of 3 years means that you cannot withdraw your 12th month SIP till 48th month while like-wise investments like ULIPS allow you to get even the last 59th premium paid to be paid out to you on 60th month maturity. During certain market downturns, one may have to just continue while your investments may be getting you negative return. Investors should consult their financial advisors if in doubt about whether the product is suitable for them. I did an analysis on the best performance in the last 20 years since when PPF tax saving limit used to be Rs. 70,000/-. If some one invested Rs. 70,000/- at the beginning of each year, the in a PPF account would have invested Rs. 14 lakhs, he would have got Rs. 34.59 and Rs. 39.03 lakhs respectively at 8 & 9 % returns in PPF. While in an ELSS, he would have got Rs 56.48, 82.46 and Rs. 263.52 lakhs in the same period respectively at assumed returns of 12, 15, 24 % rate of returns.See more here: ELSS by Taresh. Furthermore, My analysis is based on the assumption that Rs 70,000 was invested at the beginning of every year starting 1985, for 15-year periods (1985-2000, 1986-2001, 1987-2002 and so on) in the PPF as well as in the Sensex. Since there was no ELSS scheme available in the eighties, BSE Sensex has been used for doing the analysis. Dividend yield on the Sensex has been ignored because retail investors can't invest in the Sensex directly—they have to invest via index funds. The growth of the Sensex from December 1979—119 points—and December 2015—26,118 points—works out to be a compound annual growth rate (CAGR) of 16.16%. However, most of these gains happened in the initial years. If you split these 36 years into two-time periods of 18 years each, the CAGR of the first 18 years—till 1997—was 20.98%; for the next 18 years, it is just 11.54%. So, those investing in ELSS funds should also moderate their return expectations.